To become a hub of innovation, you must have at one point been a hub of failure. Because the only way to grow into a success story is to overcome and learn from the mistakes that led you down that path in the first place. That’s the inspiration behind the aptly-named F*ckup Nights speaker series. The Toronto chapter, founded and organized by Marsha Druker, celebrated their first birthday last night to a sold-out crowd of 500-plus people, as four speakers shared stories of colossal screw-ups as diverse as the audience in attendance. 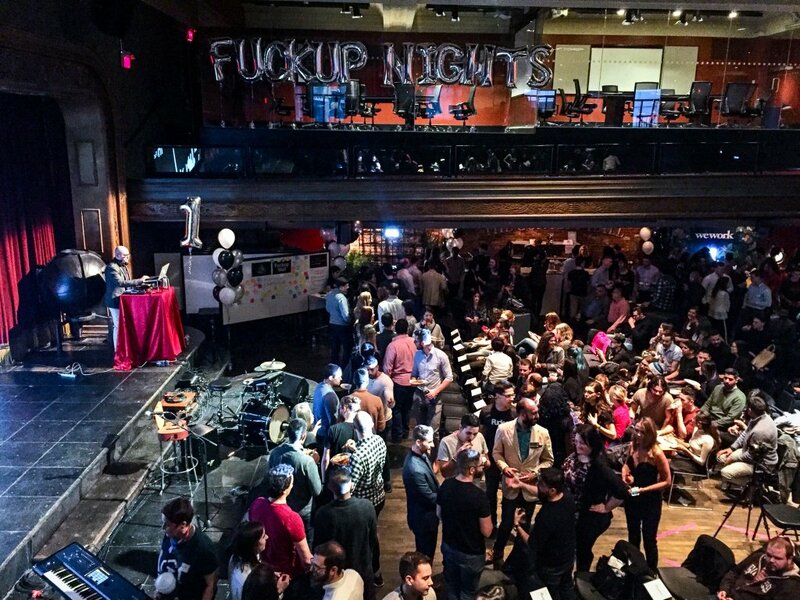 F*ckup Nights is a worldwide event, hosted in more than 250 cities and 80 countries. Druker came across her first F*ckup Night in Tel Aviv while working at a startup. She attended and found solace in the fact that so many people were so open with their tales of failure. After returning to Toronto, Druker was shocked that there was no chapter in the city. So with zero event planning and community building experience, she sought out to launch the series herself. Luckily, the head organizers are very receptive and helped her to make sure there was no messing up the inaugural F*ckup Nights Toronto. But the event has changed a lot, even in the first year. So often in the tech world, we hear stories of failing fast and moving on from missteps, without taking time to dwell on what brought us to that point in the first place. F*ckup Nights gives speakers and attendees the chance to do that—not just in tech, but anywhere failure is possible. And failure is possible in pretty much every instance of life. Speakers so far have included magicians, burlesque dancers, life coaches, entrepreneurs and more. There are founders, employees, teenagers and older folks, all united by the simple fact that they have gloriously messed up at one point or another. At the first birthday party, the four speakers mentioned a few major mess ups, including losing Oprah’s number, turning down a cushy $200,000 a year job from Facebook to start a failing business, studying law for seven years only to quit being a lawyer soon after, and more. But Druker sees the most value from stories, rather than examples. Those real stories have definitely connected with the attendees, as Druker has seen some serious response to the event so far. Meeting a co-founder at a night all about f*cking up is certainly a great story, but it goes to show how many people have experience with not being where they thought they would be, and how important confronting that notion is. There’s more coming down the line for F*ckup Nights Toronto. They already have another event prepped for April, and Druker is looking to expand the series into industry-specific gatherings. Think tech, science, advertising and more, all coming together to share how they overcame failure. But for Druker, and every single speaker at the events so far, when you ask them, f*cking up was one of the best things that could have ever happened to them.